Anne Frank House is a museum in Amsterdam at the Prinsengracht canal. The Anne Frank house is established in memory of Anne Frank. Here Anne Frank and her family hid in the famous back house for the Nazis. Worldwide Anne Frank is symbol of the Jewish population during the Second World War. This is the reason why the museum is very popular. Daily there long queues, sometimes up to a few hours! The canal houses where the Anne Frank House is housed, were built in 1635. Around 1740 there was a wealthy merchant, who built here the famous back house. The canal houses first were used as residences for years. From the 19th century the buildings were used as business premises on the Prinsengracht. Here, several companies have established their business. In the year 1940, the companies of Otto Frank moved in. Otto Frank was the father of Anne Frank. The company contributed for nearly four years to this perfect hideaway. In the company’s warehouse there was a bookcase. Behind the bookcase was the entrance to the secret back house. The back house was used as a hiding place for the Germans and their sympathizers. Here the family Frank and the family Pels, together with an acquaintance of Otto Frank lived for years. In the summer of 1944, the Gestapo raided the back house. This hiding place was invaded after a telephone tip and the families unfortunately were discovered. Fortunately for all of us Anne Frank’s diary was saved by employees of Otto Frank. 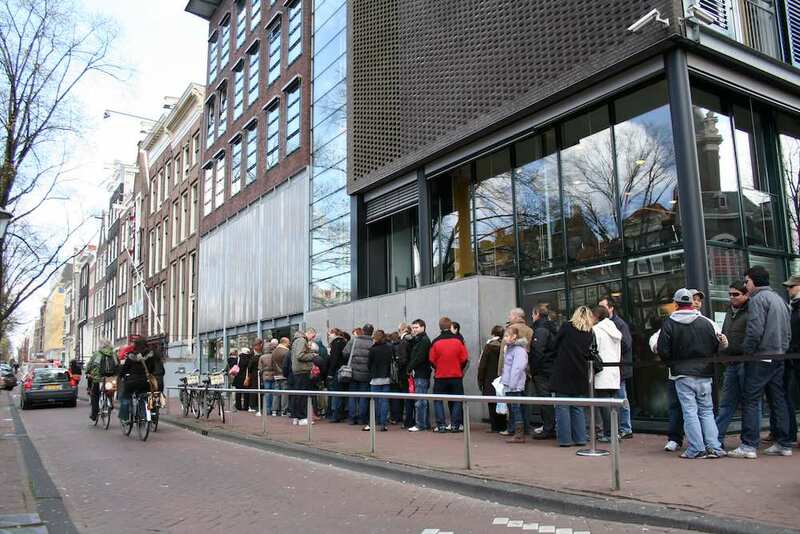 – Daily the museum has long queues, therefore we recommend to purchase your tickets in advance. – At this link you can do a virtual tour through the hiding place of Anne Frank. – Anne Frank House is easy to reach with a Hop on Hop off Canal Cruise tour. Close-by you can find a stop at the Prinsengracht. The museum attracts about 1.2 million visitors each year. Just over 10% of visitors come from Netherlands.